All the medical advances in veterinary care and improvements in nutrition have resulted in our pets living longer lives. We get to enjoy their company and unconditional love longer, but unfortunately with a longer life our beloved pets get to experience some of the consequences of older age. One of the most common orthopedic problems seen in geriatric animals is arthritis. Arthritis (from Greek arthro-, joint + -itis, inflammation) is inflammation on a joint or multiple joints. So now you can tell your friends that you speak Greek!!! A joint is where two bones meet allowing motion (shoulder, elbow, carpus, among others). There are many different types of arthritides, which can be classified as inflammatory or non-inflammatory. The most commonly seen in older pets is osteoarthritis (OA) or degenerative joint disease classified as a non-inflammatory arthritis. OA is commonly the result of loss of articular cartilage and damage to subchondral bone. If you just learned that your pet has arthritis, please know that your pet is not alone. OA is the most common type of arthritis in people in the United States and is also the leading cause of disability. Clinical signs associated with osteoarthritis include joint swelling, pain, stiffness when walking and lameness. With time, decreased joint motion due to pain and discomfort leads to a reduction on muscle mass (muscle atrophy) because of disuse. Use it or lose it! As your pet ages the water content of the cartilage decreases with reduction of proteoglycan content, with the loss of the structural framework the cartilage becomes more susceptible to damage. How do I know that my pet has OA? Watch your pet for any evidence of acute or chronic lameness (limping) such as difficulty standing, climbing stairs, reluctance to jump and stiffness when walking. Approximately 20% of dogs over 1 year old are estimated to be affected with OA. Cats also can have clinical signs as a result of arthritis, but they are masters at hiding pain so the condition is underdiagnosed in cats. 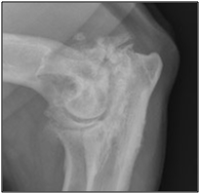 How does my veterinarian diagnose OA? Diagnosis is based on history, physical exam findings and radiographs of the affected joint(s). On physical examination the affected joint may be swollen, unstable, painful and may have decreased range of motion. 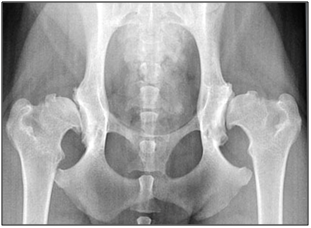 Radiographic evaluation of the affected joint(s) is the most common screening tool used by veterinarians. Collecting joint fluid of the suspected joint and analyzing it under the microscope can also give you invaluable information that can help you localize the problem joint as well as rule out other problems that may be affecting the joint. Other advanced imaging that can be used to evaluate the joint are CT scan and MRI, but are not used as often due to added expense. Minimally invasive procedures such as arthroscopy can be used to explore the joint and rule out underlying disease leading to OA. How can I help my pet with OA? Once your veterinarian definitively diagnoses OA on your pet, medical management should be implemented to improve your pet’s quality of life. Weight loss or weight management- Your pet may be obese because of inactivity, sometimes associated to the OA pain. Reduced weight decreases that stress and forces placed on the joints. A variety of commercial weight management diets are available to control the daily caloric intake of your pet while giving them the sense of satiety. Visit your veterinarian for diet recommendations. Weight management will require regular visits to your veterinarian (Doggy Weight Watchers, if you will) to monitor weight and diet. Nutritional supplements- Nutraceuticals are not marketed to diagnose, treat, or prevent disease, but are presumed to protect the cartilage and inhibit degradation of cartilage with positive effects in experimental and clinical trials. The most common nutraceuticals used are Glucosamine, Chondroitin, Methylsulfonylmethane (MSM), and Omega-3 Fatty Acids. Chondroprotectants include Adequan (Polysulfated glycosaminoglycan), sodium hyaluronate, and pentosan polysulfate. Controlled regular exercise- Your pet should be rested during the initial onset of clinical signs. During the recovery period low impact regular exercise improves and maintains joint range of motion and muscle mass. Swimming is a great exercise since it helps joint motion without the added stress to the joints. Veterinary non-steroidal anti-inflammatories such as Carprofen (Rimadyl®), Deracoxib (Deramaxx®), Etodolac (EtoGesic®), Meloxicam (Metacam®), Tepoxalin (Zubrin®), Firacoxib (Previcox®), are frequently used for pain control of orthopedic conditions. Potential side effects include vomiting, diarrhea, inappetence, anemia, and dark tarry stool. NSAID use can result in stomach ulcers, colitis, and can be toxic to the liver and kidneys. If any side effects are noted it is imperative that the medication is discontinued and to contact your veterinarian for further recommendations. Tramadol is a centrally acting synthetic analgesic used to treat mild to moderate pain. Tramadol has been used as an alternative to pure opioid medications and also given in combination with a NSAID. Acupuncture may result in increase function and muscle strength by ameliorating pain in pets diagnosed with arthritis. Amantadine is an antiviral medication used in people that may reduce the tolerance to other analgesic medications in animals. Typically it is used in combination with other pain medications because it is unknown if amantadine has any analgesic properties when given alone. Just like in people, arthritis in animals is a condition that does not have a cure, but can be managed with a combination of exercise restriction, weight management, pain medications and neutraceuticals. Once your pet’s condition is not responsive to medical management other options may include stem cell therapy and total joint replacement. Stem cell therapy in animals holds promise, but further research is needed to confirm efficacy and results of treatment. Older PostThe Dreaded "Cone of Shame"